The plain, flat panel drawers. It drives me a bit more batty on this side because the drawers below it is trimmed out. Boring, right? I used to think they had to do it that way because the drawer was small but I've seen lots of small drawers that have trim. After building up the crown and adding trim to the bottom of the cabinets I decided the drawers looked even more plain than they did before. I had a bit of cabinet trim left over so I thought what the heck, let's try it out on the drawers. I taped a few pieces on to see how I liked it. I made myself leave it for a few days so I could decide if I really liked it. After about 3 days I decided I liked the look (although I brought the trim in a little more) and decided to do all of the drawers. I affixed the trim using wood glue to begin with but changed to using a nailer with 1 inch brad nails. 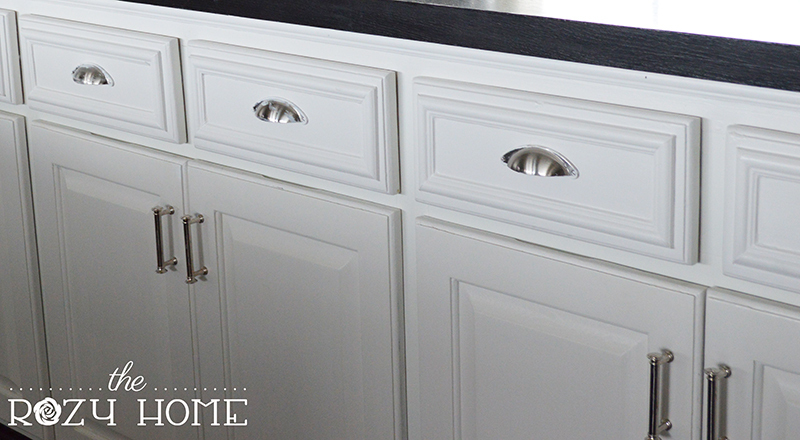 The hardest part of the project was ensuring that the trim lined up evenly across all drawers. 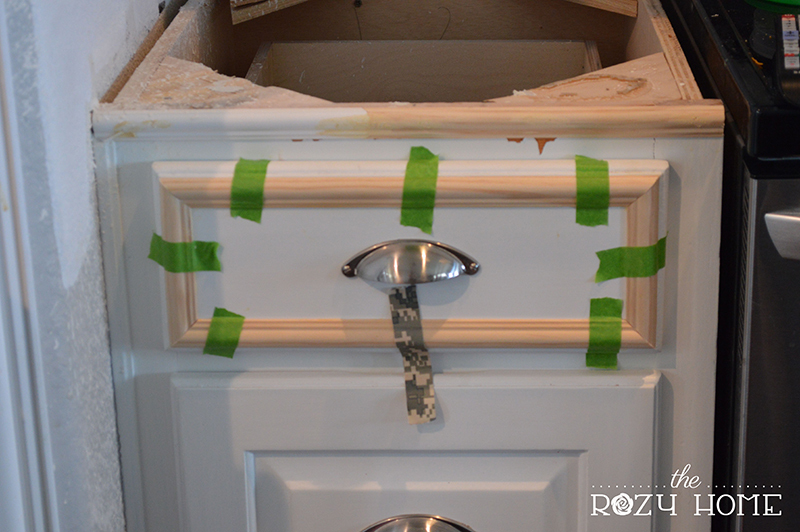 To make it easy, I opted to pull the trim in 1/2 inch all the way around. 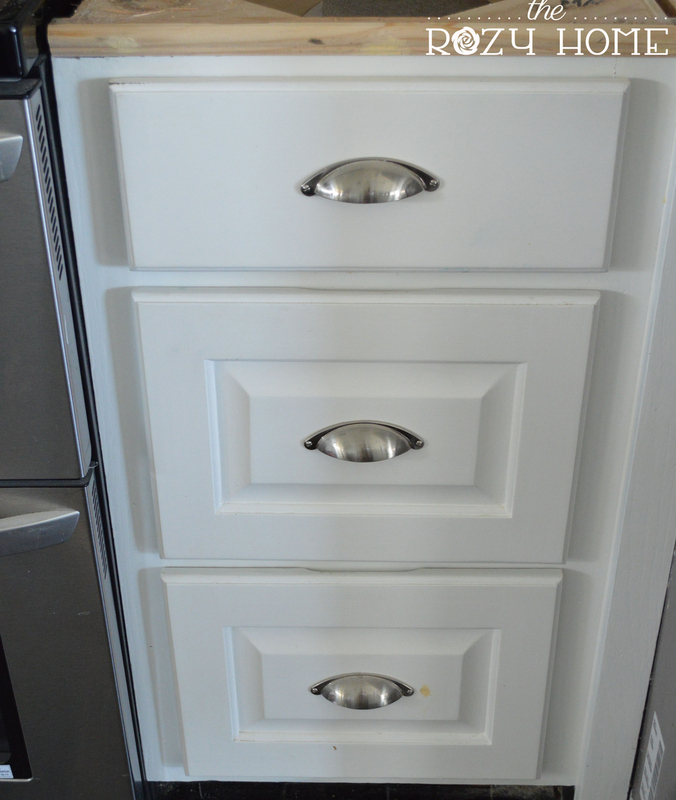 The two drawers next to the stove were smaller than the drawers along the wall. I am mentioning this because I was tempted to make all the pieces the same size to save time but my gut told me to double-check the drawers on the wall to make sure they were the same size. Thank goodness I did! This project took about 4 hours. The majority of that was cutting all of those trim pieces and then making sure they were even across all drawers (darn OCD). 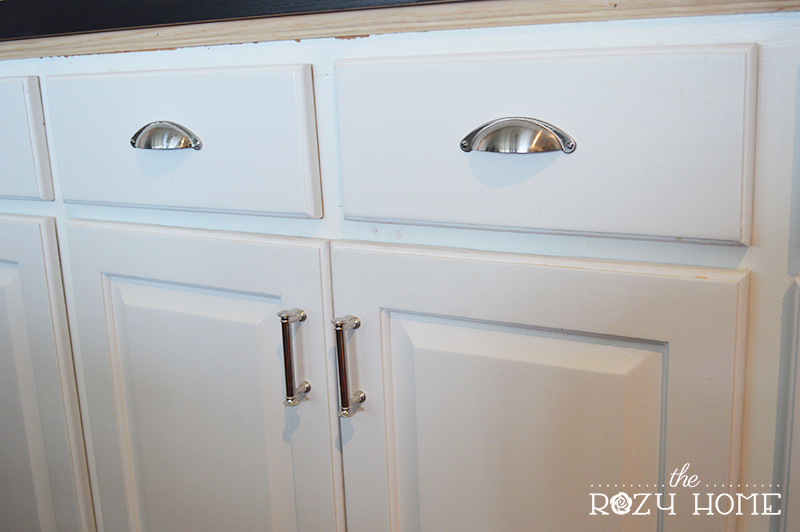 The project took 5 pieces of the same cabinet trim I used on the cabinets (trying to keep it cohesive), so the entire cost was around $26 (for 8 drawers).